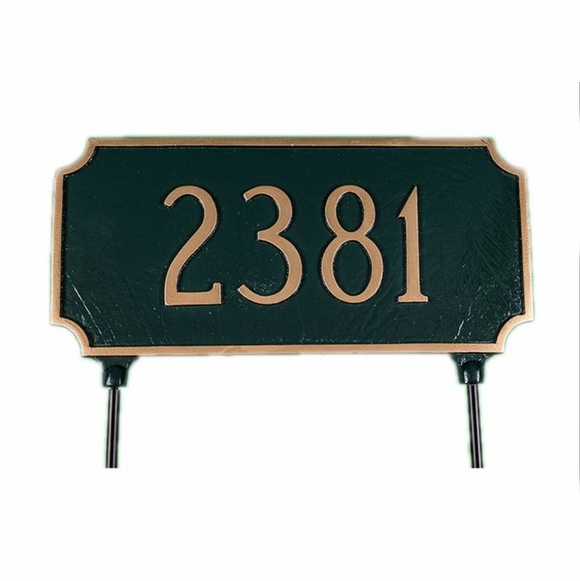 Personalized Two Sided Lawn Stake Address Sign - - made in USA. Rectangle sign with decorative cut corners holds either one or two lines of personalization. Same personalization appears on both sides of this lawn sign. On a one-line sign, Line 1 holds up to five 4" characters. On a two-line sign, Line 1 holds up to five 3" characters, and Line 2 holds up to 17 smaller characters. Comes with two 16" lawn stakes. Custom made with your personalization and color selection. Note: This sign is also available in a hanging version (Comfort House item #: P2006). Two sided aluminum sign comes in 26 different color combinations. Made in the USA. Sign arrived sooner than expected. Looked very nice and was what I had anticipated it would look like and fit nicely into our landscape scheme.